An July 17 Ohio TV news segment alerts viewers to the need for a diagnostic “safety scan” on “just about all cars on the road” and the possibility an auto insurer would refuse to cover the cost — even on a 2018 vehicle. 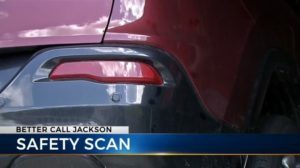 The WCMH “Better Call Jackson” broadcast features Derek Weaver, whose 2018 Jeep Cherokee was hit in the right rear in what he described was a minor parking lot impact. The at-fault party was insured by State Farm, which provided Weaver with a “list of the things that State Farm was refusing to pay for. And the first thing on the list was the scans, the pre-scan, the mid-scan and the post-scan,” he told WCMH reporter Mike Jackson. A 2016 FCA position statement mentioned by Weaver and shown in the WCMH segment calls it “necessary” for repairers to scan the OEM’s vehicles before and after a repair. It states that diagnostic trouble codes could arise before or during the repair any time a car “is involved in an accident or collision, even though the damage may appear minor.” Multiple OEMs — including FCA — say DTCs without dash lights appear in vehicles dating back to the 1990s. While the Cherokee trim level couldn’t be determined from the broadcast, footage of the 2018 Jeep shows parking sensors, indicating additional electronic sophistication a repairer would have to ensure is restored correctly. “Each claim is handled on its merits,” State Farm said in a statement to WCMH. “State Farm estimates include necessary operations to complete the individual repair, and depending on the nature of the damage and individual vehicle, State Farm may determine vehicle scan operations are necessary and will include a corresponding cost for that operation to support the amount owed to a vehicle owner. The WCMH report doesn’t indicate if Weaver plans any additional action given his warranty fears, nor does it examine the liability of Three-C releasing the car without post-repair scanning it.